Mom-and everyone-"what's up with the comments" well i am getting bad spam. Pretty much "junk comments" what do i do? I was wondering what was happening.I have no idea what to do, can James help you. I think your blog is just too popular. Maybe it was becuase you posted something about Katrina too. 4. scroll down until you see "show word verification for comments?" 6. spam messages will be blocked forever! p.s. apple hoppe is one of my favorite kawaii characters - she is really hard to find! 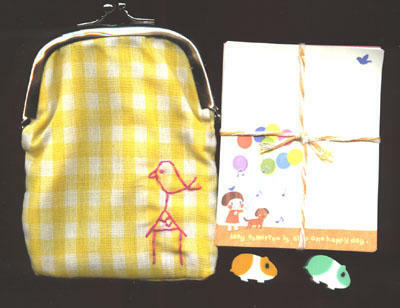 i love the little zakka coin purse - you are a lucky gal!